This week’s BEACON Researchers at Work blog post is by MSU graduate student Colleen Friel. My foray into the world of science started back when I was a high school student dead set on becoming a large animal veterinarian. To pursue that goal, I attended the Pennsylvania Governor’s School for Agricultural Sciences the summer before I graduated high school. While there, I performed my first rectal exam on an obviously displeased dairy cow and realized that veterinary medicine was not the career for me. After this rude awakening, I unexpectedly found myself fascinated by my classes in plant science and agronomy – here was a way to engage in science that fed the world (and, as an added benefit, did not involve orifices of any kind!). As an undergraduate, I performed research in microbiology, forestry, and plant biology, a combination that led to my interest in my current field of research, plant-microbe interactions. I was fascinated by how interactions between plants and organisms too small for the naked eye to see were so important on so many scales–they are vital to the functioning of natural ecosystems and goals of feeding the growing population sustainably. 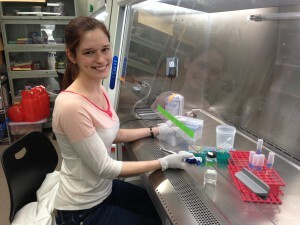 Here in the Friesen lab at Michigan State, my research focuses on how plant and soil microbes exchange resources. One system I study is the mutualism between legumes (plants such as peas, beans, and clover) and soil bacteria called rhizobia. 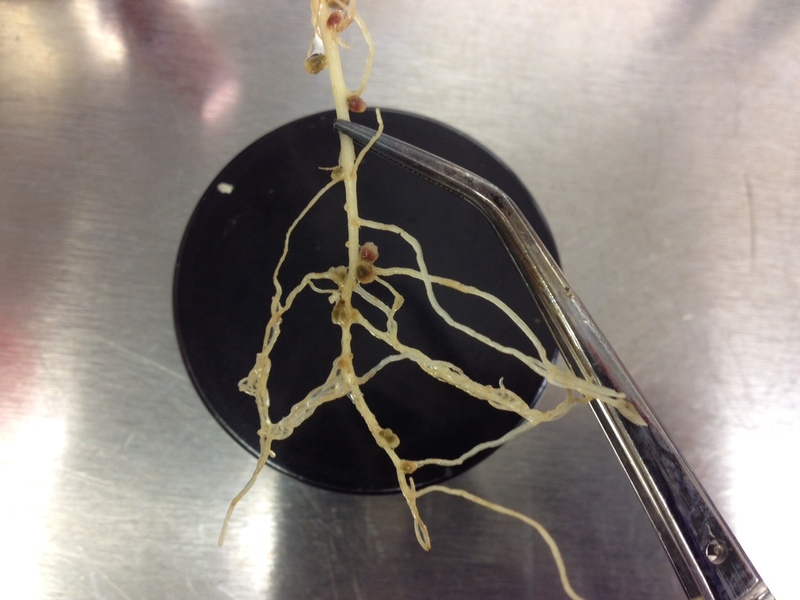 Rhizobia induce some plants to form specialized organs on their roots, called nodules. 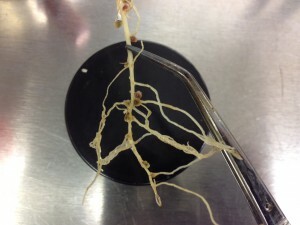 The rhizobia live in the nodules and fix nitrogen gas from the atmosphere into a form that the plants are able to use. In return for fixing nitrogen, the plant supplies the rhizobia with photosynthetically fixed carbon. This interaction is like a biological market, where the plant and rhizobia trade carbon for nitrogen vice versa. Each organism must decide how much effort they will put into independently acquiring resources (e.g., the plant deciding how much effort to put into root growth to directly take up nitrogen from the soil) and how much effort they will put into trading for resources (e.g., the plant deciding how much carbon to supply to its rhizobia in exchange for nitrogen). Using economic theory about how markets work, it is possible to create mathematical models that describe the costs and benefits legumes and rhizobia incur through this trading agreement. In a collaborative project with the Yair-Shachar Hill lab at MSU and Emily Grman at Eastern Michigan University, we are currently working experimentally validating an existing mathematical model to describe the outcome of the legume-rhizobia mutualism in different environmental conditions. We are using photosynthesis, biomass, and carbon and nitrogen content measurements to estimate parameter values for a previously written model that we adapted to the legume-rhizobia symbiosis. We will test the model by comparing its predicted outcomes to those observed in nature or a novel set of experiments. This work is making important connections between theoretical ecological models and empirical physiological studies, while helping us understand the context-dependent effects of mutualisms on community structure. Another economic theory that can be applied to the legume-rhizobia mutualism is the tragedy of the commons, where an individual acts against the common interest of the group by depleting a resource for its own benefit. The tragedy of the commons is a situation faced by farmers who are able to graze livestock on village commons: each farmer is motivated to graze as many animals as possible to maximize his or her personal benefit, but this will lead to overgrazing of the commons and depletion of the resource for everyone. In the context of legume-rhizobia interactions, one would imagine that rhizobia would often become “cheaters” in this system-that is, that they would direct their resources towards their own growth and reproduction rather than toward fixing nitrogen for their host plant. Thus, we would expect rhizobial populations to be dominated by these cheaters who fix little or no nitrogen while still acquiring carbon from the plant. However, this is not the case: rhizobia are very diverse and are not dominated by cheating strains. One possible mechanism that could be stabilizing the mutualism is sanctioning, or the plant “punishing” cheaters for being less cooperative. Plants may punish rhizobia by decreasing nodule carbon or oxygen supply or by promoting early nodule death, but we do not currently understand the exact mechanism of these sanctions. I am making a mutant strain of rhizobia that is unable to fix nitrogen because of a missing protein. Once I finish generating this mutant, I hope to use it for a number of experiments where I will use techniques such as RNA sequencing to determine how the plant’s response differs between cheating and fixing rhizobia at the molecular level. This project will help us identify the genes and proteins that plants use to sanction cheaters, which could help us to understand how legumes and rhizobia co-evolved. My research seeks to better understand how legumes negotiate interactions with their rhizobial partners. With it, I hope to provide insights into important questions in ecology and evolution about the stabilization of mutualisms, their context-dependency, and their effects on community structure. For more information about Colleen’s work, you can follow her on Twitter (@colleen_friel) or email her at frielcol at gmail dot com. This entry was posted in BEACON Researchers at Work and tagged BEACON Researchers at Work, Biological Evolution, Cooperation, plant biology, rhizobia. Bookmark the permalink.